UNDISPUTABLE FACTS ABOUT JOHN MAHAMA’S AVIATION INFRASTRUCTURE PROJECTS- 2009 – 2016. Despite evidence to the contrary, the NPP government and its communicators are bent on distorting facts about the laudable infrastructural projects initiated during the National Democratic Congress (NDC) administration of John Dramani Mahama. The positive impact of these projects, which were executed under the visionary Agenda for Transformation of President John Mahama, and focused on a clear vision to begin closing the huge infrastructure gap across the country, are now beginning to be felt. Especially in relation to health, educational, roads, and aviation infrastructure, even known sympathisers of the government have taken to social media and other platforms to acknowledge the developmental focus of the just past NDC administration and their expected contribution to economic growth and living conditions of the citizenry. Nevertheless, considering the consistently negative spin engineered by the NPP against NDC projects, one can understand the unfortunate agenda by government led by President Akufo-Addo himself, to quickly throw dirt at the former president about these projects, which include lies about project costs. 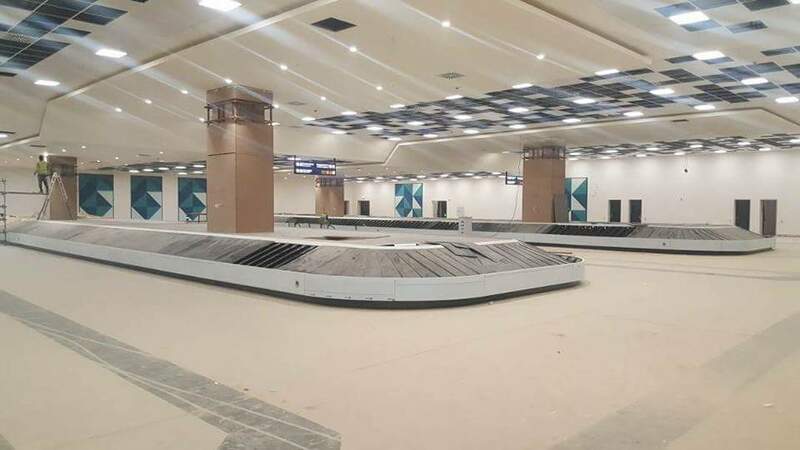 Ahead of the planned inauguration of the Kotoka International Airport’s flagship Terminal 3 project, now referred to by many as the Mahama Terminal, an agenda to misinform the public for political gain has commenced. Obviously, the new government cannot seek to claim as it had shamelessly tried to do in the past with other projects, that they were the originators of the Mahama Terminal. Thus, they are attempting other similarly sordid strategies. The truth and facts surrounding the Mahama Terminal and other aviation sector projects are well documented and are available. The fact that this and other well-thought-out infrastructural development strategies in the Aviation Sector were undertaken based on the vision of John Mahama cannot be disputed; the fact that the socio-economic benefits arising from these projects will contribute to economic growth and impact the lives of the people generally should be recognized; additionally, we should be developing strategies to further reduce the infrastructure gap that Ghana is currently suffering. 1. Negative news reports have sought to erroneously create the impression that the T3 Project is expensive and overpriced. This they do by disingenuously comparing the Ghana Airport Company Limited’s (GACL) T3 Flagship Project cost of $275 million to airport projects in other countries like Ethiopia (claiming three airports were constructed for $64million) and Cape Town Airport ($64 million) without proper reference to the respective scopes of work, bills of quantities, relevant contract considerations for the respective projects among others. 2. Most airport infrastructure projects are specialized, and are typically designed to address specific needs of the particular airport. As the case is for most specialized facilities such as hospitals and airports, the total project cost depends on many variables such as scope, time, materials, local and international standards and specifications that must be met. Accordingly, such projects are not comparable across board like the simple commodities such as oil or bananas without the appropriate reference to the scope of works and bills of quantities and the relevant contractual provisions. In other words, context matters. 3. For example, the entire green-field Ho Airport development project cost $26 million. However, the Ho Airport, constructed from scratch, can only handle small and medium size aircrafts. The point is, it is a non-starter to attempt to compare airport project costs without due reference to the scopes, bills of quantities and contractual requirements. In any case, there are reports that one of the Ethiopian airports required additional financing, which ballooned its cost. 4.1 Design and construction services for the fast-track construction, commissioning and handing over of international terminal structures, including the main Terminal building capable of handling five (5) million passengers a year, CIP and Presidential VIP facilities, compliant with all existing ICAO and IATA standards and specifications for international airports. 4.2 Provision of baggage handling systems, check-in counters, security and screening counters and equipment, FIDS and mobile passenger air bridges as necessary, civil works, utilities and services, fit-out, communication/IT and other special airport systems. 4.3 New open air parking area, realignment and construction of land-side road network accessing the T3 building, CIP and VIP facilities including the connections to the existing terminal buildings and associated services as necessary. 5. After appropriate internal reviews and assessment, due diligence and international competitive tender and the requisite approvals of the Public Procurement Authority (PPA), the contract for the T3 project was awarded to MAPA Construction & Trading Company Limited, for $250.1 million. 6. The contract price was later varied by $24.86million as a result of changes that the GACL requested to address post-contract award security concerns that necessitated design changes and additional equipment. It is important to note that all GACL internal due diligence and processes as well as PPA tender guidelines, including value for money justification and the approval of Central Tender Board were completed satisfactorily. 7. Because GACL Capex projects are financed with funds from private Commercial Banks and Development Finance Institutions, the project was subjected to rigorous reviews by the technical and credit committees of the respective financing institutions for approval.The financing institutions knew all along that there were no government guarantees to support the loans so they had to sharpen their pencils to ensure the commercial viability and integrity of the projects. 8. Commercial Tranche of $250 million, led by Ecobank, was syndicated among seven local and international banks- Qatar National Bank, Standard Chartered Bank, Barclays Bank, Nedbank of South Africa, Ecobank and UT Bank. All these commercial banks independently assessed the T3 Project as good and creditworthy and approved it. 9. The Development Finance Institutions, Africa Development Bank, Development Bank of South Africa and Ghana Infrastructure Fund, which together provided $205 million in long term financing for 15 years, also conducted exhaustive due diligence before approving the facility to GACL. 10. Further, and as condition for approval and continuing funding, the DFI’s appointed a Lender’s Technical Advisor from the UK, Mot Macdonald, to conduct technical and financial evaluation of the T3 project before they funded their facilities. Moreover, under the facility agreement, the LTA reviews all construction payment certificates against the construction progress before it endorses payment. 11. So, in all, there have been several levels of due diligence and critical project assessment by competent professional and technical teams. None of these professional assessments reported any negative findings or revealed any over pricing or irregularities about any of the Capex projects that they funded. 12. It is clear from Point 4 above that, the scope of the T3 project is quite comprehensive and goes beyond the physical terminal buildings and air bridges. The terminal buildings themselves are massive edifices and should deservedly attract the attention and interest of the general public. The main terminal is 45,015sqm in size and the CIP and stand-alone Presidential VIP buildings are 1,430sqm and 1,035sqm respectively. The Mahama Terminal is, of course, a game changer for the aviation sector in Ghana and we should be proud of it. The support and funding from private commercial investors and institutions, who are carrying the full project risk without any government guarantee, should indicate to all concerned citizens that the projects are well conceived, structured, and beneficial to the nation. Those elements of society that are peddling disingenuous information should therefore learn to appreciate good projects and give credit to those who deserve it regardless of political colour and perspective. This generation, as well as future ones to come will always remember that the KIA Terminal 3 Project is a testament to the strategic leadership and foresight of President John Dramani Mahama.